As many of you know by now our good friend and collegue Bob Meyer passed away on June 24th, 2013. Bob was a monster trumpet player and composer/arranger. 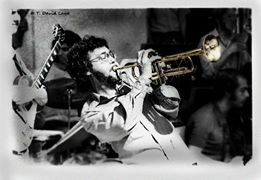 His presence in the S. Floriad and University of Miami jazz scene has had an huge impact on all our musical development. He will be sorely missed. He and I had played together in many bands. 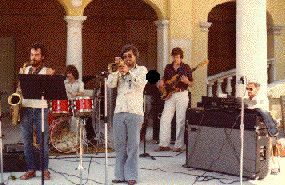 The photos and tracks on this page are from our association with the band Concept which Bob had instigated. His big band writing is represented by the Infusion Suite. RIP Bobby. 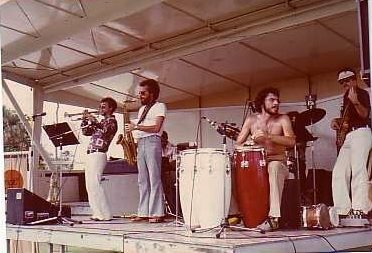 Photos of the band Concept at various PACE concerts: Bob, trumpet; John Alexander, sax;Steve Watson, guitar; Ron, Rhodes; Steve Rucker, drums; Oscar Salas, congas; Jeff Carswell, bass. First photo is of Bob and Steve Bagby in high school, wow what a statement! !